April 12, 13, 14, 15 & 16, 1983. “Dear Audience, The Bible has been the inspiration of many dramatic works, but when Obey wrote Noah he only used the story as a basic plot on which to build his play around. There is far more to this Noah than just the religious aspect. Throughout the play we follow the changing attitudes of eight people and a group of animals who fined themselves forced together through a major world disaster. It was not, of course, possible to build an Ark on the Biblical scale so, rather than try, I have chosen the simplest of settings, leaving the imagination of the audience to create their own surroundings. Robert McCourty, Nicolas Davion, Charles Porter and Margaret Faggetter are making their debuts for the company. Jill Redman, taking her first major rôle and Louise Bray-Allen both appeared on stage earlier this season. Completing the human element of the play are Brian Moulton, Jean Porter and Rosemary Biggs, all long standing members of the company. Lurking behind the six animal masks of our menagerie are three new faces and three familiar ones. The new faces belong to Mark Flowers, Sarah Sherry and Victoria Ogden. The three familiar ones are Miranda Bowen, Joan Bearman and Douglas Tucker. THE Wick Theatre company are planning on not just April showers but floods at the Barn Theatre – floods of people that is to see their production of Noah. With the stage transformed into an ark, the cast will be telling the tale of how the family and animals survived the floods. Wick have chosen a play written in the 1930s, by Andre Obey, which is loosely based on the biblical tale. Heading the cast is the experienced Brian Moulton as Noah, pictured above with some of the ‘animals’, the man with the job of looking after them and his family. The part of Noah’s wife is taken by Jean Porter, whose son Charles is also appearing, as one of the six children. Director Anthony Muzzall has not been afraid to use new people in his cast, with most of the six children being relatively new hands on the stage. Mr Muzzall has also turned his talents to making the animal heads for the production. 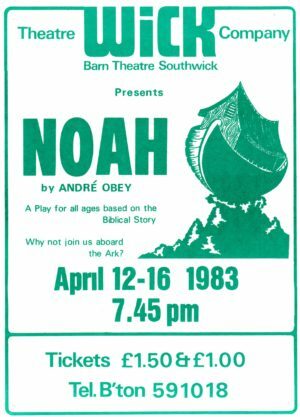 THE presentation of Obey’s famous play Noah by the Wick Theatre Company next week marks the return after some time away from the company of Jean Porter. She plays Mrs. Noah, with Brian Moulton as her husband. Also in the cast paying his first part is the Porters’ younger son Charles. This play is the first essay at directing of young and talented Anthony [sic], Muzzall who is making of improvisation techniques in directing the animals. Incidentally, among the animals will be Miranda Bowen who was so charming as the horse in the company’s pantomime. This time I believe, she is a tiger and certainly a very elegant tiger. The play runs from April 12 to 16 at the Barn Theatre, Southwick. By way of contrast [web ed – WH’s piece had an opening review before turning its attention to Wick’s production], Andre Obéy’s very thoughtful play Noah goes beyond a mere telling of the Bible story and postulates attitudes of discontent and rebellion by Noah’s children. The Wick Theatre Company production at the Barn Theatre, Southwick this week is notable for some quality acting but, particularly for young Antony Muzzall’s very artistic and detailed direction. Brian Moulton has the arduous rôle of Noah and plays it very well except that I should be happier if he moderated his last scene helping the play along to a gentle finish. Jean Porter is a quite splendid Mrs. Noah, Robert McCourty, new to the company, is a finely abrasive rebellious Ham while Charles Porter and Nicholas Davion, also making their first appearance, give nicely contrasted characterisations to Shem and Japheth. Very much the same may be said of the three girls with Jill Redman a very decisive Naomi, and Margaret Faggetter and Louise Bray-Allen as the milder Sella and Ada. The animals are well costumed and masked and contrive to express themselves without words. Sarah Sherry is a delightful little lamb with a most authentic bleat, Victoria Ogden is a sprightly monkey and Miranda Bowen is a very elegant tiger. The age-old conflicts between good and evil and ‘believing’ and ‘non-believing’ were put into dramatic perspective by Wick Theatre Company at the Barn Theatre, Southwick last week. Noah, an updated version of the famous biblical story, by Andre Obéy, was a powerful piece of theatre that demanded strong characterisation. And Wick had just the actor for the job in Brian Moulton, whose performance in the title rôle was as rock-solid as the Ark itself. His homely expression of his faith in God – his conviction that the Almighty would bring the Ark’s human and animal cargo safely through the floods – reached such seemingly naive proportions his family at one stage rejected him. Leading the rebels was Noah’s son, Ham, superbly portrayed by Wick debut-maker Robert McCourty, whose sneering, leering attitude and seared complexion combined to make him the epitome of ‘non-belief’. The two main protagonists were admirably backed up by the experienced Jean Porter [Mrs. Noah] and other Barn newcomers Charles Porter [Shem], Nicholas Davion [Japheth] and Margaret Faggetter [Sella]. Jill Redman [Naomi] coped well in her first major rôle and the human cast was rounded off by Louise Bray-Allen [Ada] and Rosemary Biggs [woman]. The story of the Ark would not be complete without the animals, of course, and these were played by youngsters Mark Flower, Victoria Ogden and Sarah Sherry and senior members Douglas Tucker, Joan Bearman and Miranda Bowen.